Brittany McVicker Pitts didn’t know one of the strongest storms to hit the Florida Panhandle was headed straight to her home. Nearly a week before the Category 4 storm struck her apartment, the 34-year-old divorced mother gave birth to her fourth child, Lawson. As the storm approached, Brittany and her mom decided to hunker down to protect her family. She huddled her kids and newborn baby in her apartment’s living room as the floors flooded and the roof was torn apart. All I could think was that we’re not going to make it,” she says. “Then, at the same time, fear this overwhelming sense of guilt that I should have left. Brittany was nervous about the storm’s aftermath. She was nervous to see how her home town would be wrecked and nervous to learn about who didn’t make it. But, she was more nervous about her son, Wyatt, who spent the night with her ex-husband in his home 10 minutes away. When the skies cleared, Brittany packed the minivan with diaper bags and backpacks and began the 16-hour drive to her mom’s home in North Carolina. She desperately called her ex-husband trying to find out if her son was safe, but power lines were down. She focused on the road but couldn’t stop thinking about whether she would ever hear his voice again. 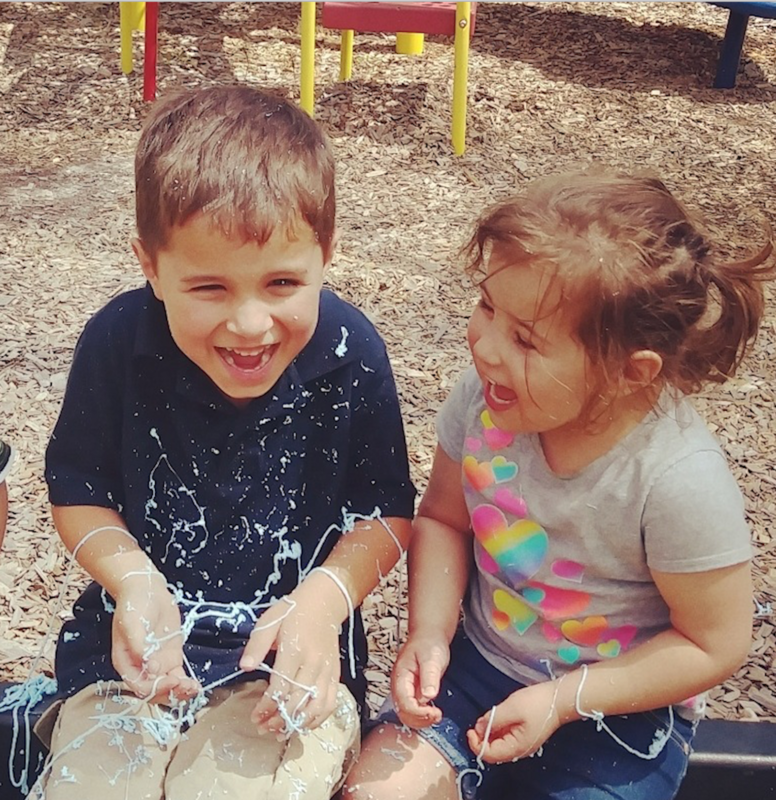 Brittany McVicker Pitts’ children, Wyatt (left) and Charleigh (right), playing with silly foam. Brittany was 600 miles away from her son after the storm. She didn’t see him for more than a month. The separation of a family due to a hurricane and the struggles of rebuilding their lives after break even the tightest of family ties. The pain of family separation after a hurricane is something many storm survivors experience. After Hurricane Katrina, more than 100,000 victims were separated from their families, according to a 2005 Gallup Poll. When Brittany reunited with her son, she cried when she saw her ex-husband’s truck pull into the empty Target parking lot. Separation is one way hurricanes can negatively affect a family’s dynamic. Families also struggle with rebuilding their lives. Nichole Dawson, a wife and mom of three, says her family is experiencing a range of problems. Shortly after Hurricane Michael hit her home, even the most basic everyday tasks became stressful from storm damage and debris. For Nichole, buying groceries meant a two-and-a-half-hour drive. Taking care of her disabled father was another hour-and-a-half trip. I’ve cried a lot of tears,” she says. “I don’t think I can cry anymore and then it happens. It’s very depressing. The post-storm stress can also affect people’s marriages. Nichole says she and her husband Spenser fight now more than ever before. The more strain or distress parents have can cause their children to be more likely affected by a mental illness, according to a survey on children who experienced Hurricane Katrina. Spenser says his 14-year-old son, Jonathan, showed signs of depression every day for about six months after Hurricane Michael. He became quiet and is drawn into video games more. For families like the Dawsons, storm damage goes beyond fallen trees and destroyed buildings. There is no quick or simple solution to fix the broken homes and broken lives their children face.